Supplier of robotics, process automation, and electrification components, ABB, has announced its intent to acquire GE Industrial Solutions for $2.6bn. This follows its recent acquisition of B&R Automation, an industrial software and automation hardware company, which added established product lines in PLCs, industrial PCs, I/O modules, servo drives, and servo motors to the ABB portfolio. The acquisition of GE Industrial Solutions will begin with its being integrated with ABB’s Electrification Products (EP) division, with an expected cumulative one-time cost for integration and implementation of $400m. ABB’s Chief Executive Officer Ulrich Spiesshofer and Chief Financial Officer Timo Ihamuotila stated that challenges for GE that include an ageing portfolio, a declining share of the US market, and a below-peer margin. The focus after the integration will be to make the GE Industrial Solutions better before making it bigger. CEO Ulrich Spiesshofer stated that the GE Industrial Solution portfolio will be leveraged and will bring in ABB’s technology. ABB plans to provide a digitalised portfolio to address the issue of an ageing one The decision to update this portfolio is important, coming at a time when Industry 4.0/IIoT is maturing in the industrial automation market. One of the biggest changes is in the market for low-voltage motor control centres (LVMCC) is that by acquiring GE Industrial Solutions, ABB becomes one of the top three suppliers of this product in the world surpassing Schneider Electric. Additionally, ABB joins supplier Eaton to have the highest market share for LVMCCs in the EMEA and APAC regions. Overall, specifically for the switchgear market, IHS Markit estimates that ABB was behind Siemens and just slightly ahead of Eaton on global market share. The acquisition of GE Industrial Automation will increase ABB’s market shares enough to move marginally ahead of Siemens. In the American switchgear market, ABB previously was one of the top five suppliers for some of the switchgear portfolio (using 2015 data). The acquisition has resulted in ABB gaining significant market share for an additional two switchgear products: LVMCCs (seven percent) and transfer switches (12.5%). The biggest change in the American switchgear market is in low-voltage contactors; going from a 6.5% share to 12.5%, making ABB the second biggest supplier and closing the gap with Schneider Electric. 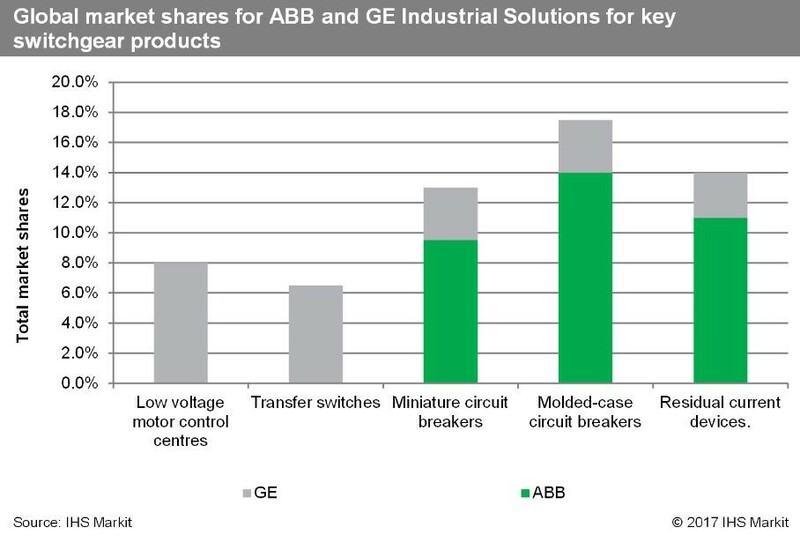 The ABB acquisition of GE Industrial Solutions will fill some gaps in its electrification portfolio, as well as increase its presence in North America, especially in low-voltage contactors and low-voltage motor control centres. Globally, the acquisition will have an impact on other areas of switchgear, such as miniature circuit breakers, residual circuit breakers, and molded-case circuit breakers. IHS Markit anticipates that, overall, ABB will gain market share in the global switchgear market to become marginally ahead of Siemens.